'Question is - what's more environmentally friendly - going to an independent store, by anything else than on foot, or ordering a CD online?' - asked the irrepressible violainvilnius in a comment on a recent post. I don't know the answer, but we've just arrived back from Belgium with a bunch of CDs bought from an independent dealer and managed to travel by walking, a bicycle, train, bus and just one short taxi ride on the whole trip. 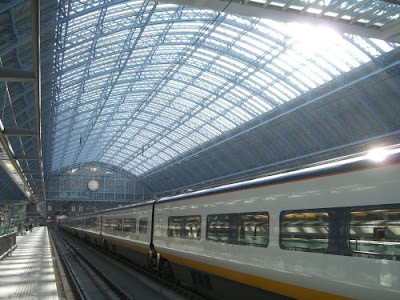 The main part of the journey was by Eurostar train which now leaves London from the splendidly restored St Pancras station, seen in my photo above, and stops at Lille before arriving in Brussels just one hour and fifty three minutes later. It may not be environmentally perfect, but it's a step in the right direction. Now playing - MGV (Musique à Grand Vitesse) by Michael Nyman. This 27 minute orchestral work was commissioned by the Festival du Lille for the inaugaration of the TGV North-European line which we travelled on to Brussels. The first performance was by the Michael Nyman Band and the Orchestre National de Lille under Jean-Claude Casadesus in Lille in 1993. There is a surprising amount of classical music inspired by trains, with Arthur Honegger's Pacific 231, Heitor Villa-Lobos' Little Train of Caipira and Steve Reich's Different Trains among the best known examples. But my favourite is a little more obscure. In 1983 the composer and director of music at Ely Cathedral Arthur Wills was asked to write a work in aid of the Ely Cathedral Restoration Appeal. The result was the choral work The Spiritual Railway which sets words taken from a memorial slab in the grounds of the Cathedral commemorating a railway worker killed on the track near Ely. The Spiritual Railway was given its first performance on Platform 10 of London's Liverpool Street Station, the terminus for the Ely train. Now take the train to the Music and Railways website which not only includes The Spiritual Railway but also manages to find railway connections in Bruckner's Fourth Symphony and Dvorak's Serenade for Wind Instruments! Which only leaves me to ask how green was your concert?